The Val d' Uina is the new highlight of our classic. After more than ten years, we changed the route last year. This was made possible by employing a small trick. In Nauders, we'll ride a loop and traverse the canyon from south to north. That way, the Uina experience is the most beautiful. The rest of the route almost exclusively follows "historic" paths, the ensuing views are well known from countless bike magazine photo stories. Daily stages with 1200-2000 meters altitude gain make the tour challenging but not extreme. Today, the Inn valley has all sorts of challenges laid out for us. Our starting point is already in the very best mountain bike country. After an initial trail-finale, we'll end the day in a top 4-star wellness hotel in Nauders. For this pinnacle stage, we'll complete an impressive loop. 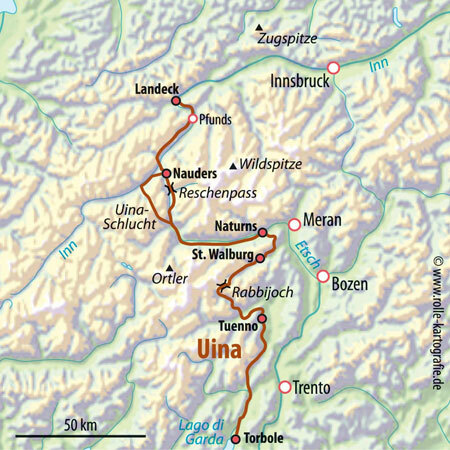 The Val d'Uina is our downhill goal. This will be a day we'll not soon forget. Accommodations in a 4-star wellness hotel in Nauders. Over the Plamort and the Lake Reschen, with the magnificent Ortler massif before your eyes, down to the warm Mediterranean Vinschgau. Here we are happy about the best Vinschgauer Trails up to Goldrain. Holy Hansen and Aigen Trail are not to be missed, of course. Now it's about to get chilly. The ascent to the 1922 m high Naturnser Alm requires intense concentration. At the summit, the fantastic mountain world of the Ortler presents itself. On a tricky downhill, we'll ride over flowing trails down into the Ulten Valley towards St. Walburg. Over varied forest paths, we will roll from St. Walburg to St. Gertraud and admire the ancient larch trees. After a steep climb and some pushing passages, we'll get to the almost 2500 m high Rabbijoch. With a bit of luck, we'll be able to get some roasted chamois with polenta at the Haslgruber hut. The downhill is one of the best in the Alps. On our way towards Tuenno, we'll enjoy every meter. In the winter sports resort of Andalo, our route takes us through lush apple orchards. We'll ride along Lake Molveno with the gigantic backdrop of the Brenta Dolomites around us as we near our destination. One last trail will lead through the Marocche before we'll wash away the dust of the journey with a dip in Lake Garda. At the farewell dinner, we'll enjoy the best cuisine of Trentino. Thomas Uhlirsch, ALPS bike guide for the Transalp Uina and Transalp Riva. Type of route: Forest and gravel paths, secondary roads, trails, passages of pushing and carrying.